In a large, wedge-shaped display case, objects from the collection holdings and from everyday culture meet. Both groups depend upon and influence each other in terms of how they are interpreted and observed. This arrangement, done according to size and color, questions the typical ordering criteria of museums - resulting in surprising encounters between objects across historical eras and geographic boundaries, encounters which all play a role in a networked world and in culture´s collective evolution. This diversity of relationships bears within it the potential for critical reflection on the issue of just what is admitted to a museum collection and for what reasons. 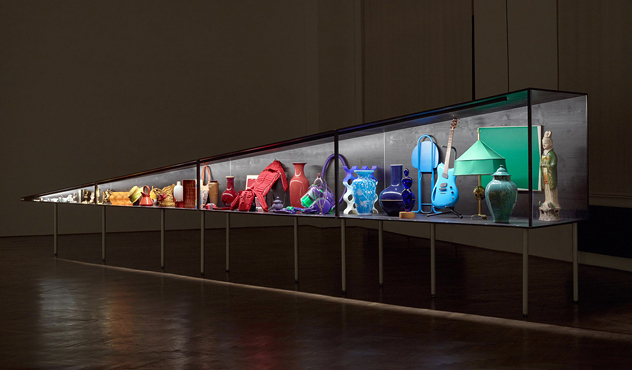 With this display case, Krüger & Pardeller give the curators the opportunity to question a hegemonic collecting tradition to the benefit of factors relating to the senses, thereby effecting a shift in perspective which potential lies in an alternative definition of what a museum does.